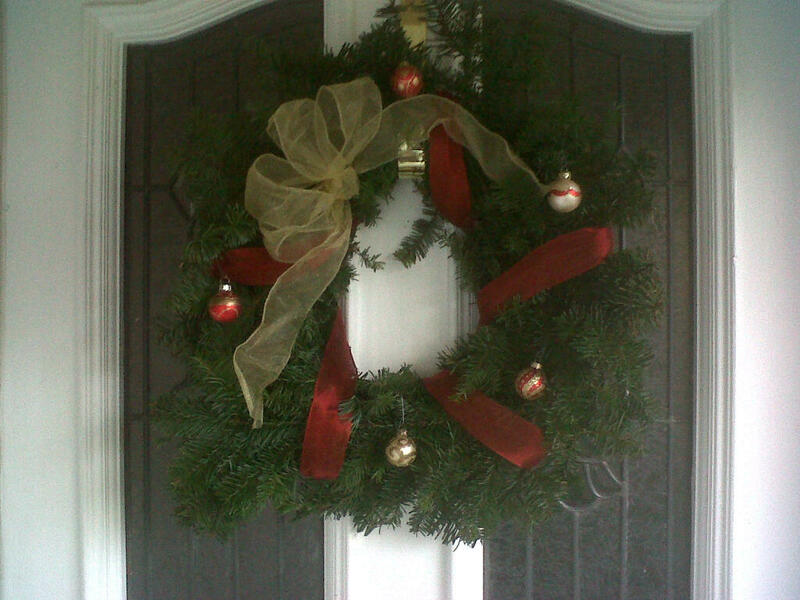 Yesterday I made a wreath for our front door! After I was halfway done, I realized I should have taken pictures throughout the process, but oh well. Maybe next year. I’ll explain instead. Two years ago, I bought a fresh wreath from Trader Joe’s. It was probably $20 and looked great, but when we put all the Christmas decorations away that year, my husband took out all the branches and saved the metal cage thingy that holds it all together. The following year (last year) I grabbed some extra branches from Home Depot when we picked up our Christmas tree – they always cut off a few from the bottom of each tree they sell and anyone is allowed to take the extra branches. It takes some time (and practice – last year’s did not look nearly as good as this year’s) to clip the branches and fit them in the cage so they form the shape of the wreath, but it is so fun to be able to say, “I made that!” I even saved the ribbon from last year (the gold bow was from the original store bought wreath) and added some little ornaments. ~ A quilt for our guest bedroom. ~ An apron for my friend. ~ A book page wreath. ~ A cover for my sewing machine. ~ Flower pens for my students. I just realized the last thing I *really* made was clam chowder from scratch for dinner last night. It was delish! !